Scullen 8th grade Flag Football suffered a tough loss to Granger yesterday. Great plays were made by Trevor N, Will P. and Jake J. Luke . had an amazing interception and Amaan F. scored a touchdown. The 7th Grade Flag Football Sharks are now 2-0! 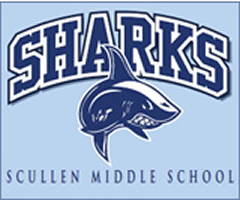 Coming off of an 18-6 win over Granger, the Sharks will take on Still middle school @ Scullen today (9/13). Rishab took the first play of the game 75 yards for a score followed by Nick rushing for a TD and 2-point conversion. Outstanding play by both the offense and defense. This truly was a team win! Keep up the great work ladies and gentlemen.